Peter Tobin, the U.S. Marshal for the southern district, swears in Fayette County Sheriff’s Office deputies as special deputy U.S. marshals on Wednesday: deputy Andy Parks, Sgt. Chuck Kyle, chief deputy Andy Bivens and deputy Howard Wood. 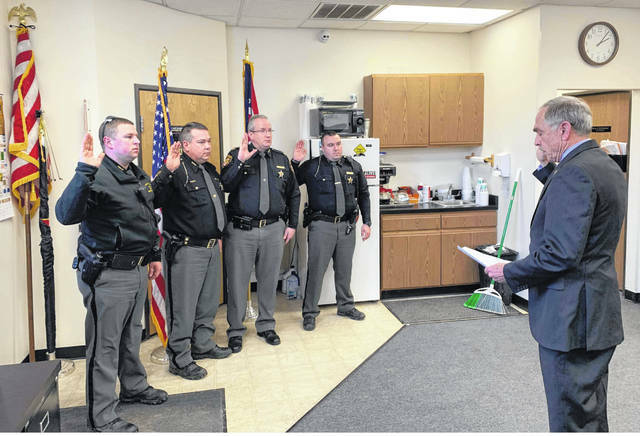 Four Fayette County Sheriff’s Office (FCSO) deputies were sworn in Wednesday as special deputy U.S. marshals, and will be contributing to the U.S. Marshals Southern Ohio Fugitive Apprehension Strike Team (SOFAST). SOFAST is a multi-jurisdictional law enforcement organization created to arrest the most violent felons in the Southern District of Ohio. On Wednesday afternoon, Peter Tobin, the U.S. Marshal for the southern district, visited the local annex building to swear in FCSO Chief Deputy Andy Bivens, Sgt. Chuck Kyle, deputy Andy Parks and deputy Howard Wood. SOFAST strike teams are headquartered in Columbus, Dayton and Cincinnati. They are comprised of agents, officers and deputies from multiple federal, state and local law enforcement agencies. Each member of SOFAST is deputized as a special deputy U.S. marshal, thereby giving each member the ability to travel in an effort to apprehend felony criminal offenders. Bivens said he and the other three deputies are proud to assist the U.S. Marshals Service in any way they can. The U.S. Marshals Service — the first federal law enforcement agency in the United States — occupies a uniquely central position in the federal justice system. It is the enforcement arm of the federal courts, involved in virtually every federal law enforcement initiative. Presidentially-appointed U.S. marshals direct the activities of 94 districts — one for each federal judicial district. It is the federal government’s primary agency for fugitive investigations. https://www.recordherald.com/wp-content/uploads/sites/27/2019/02/web1_received_298021194241130.jpgPeter Tobin, the U.S. Marshal for the southern district, swears in Fayette County Sheriff’s Office deputies as special deputy U.S. marshals on Wednesday: deputy Andy Parks, Sgt. Chuck Kyle, chief deputy Andy Bivens and deputy Howard Wood.